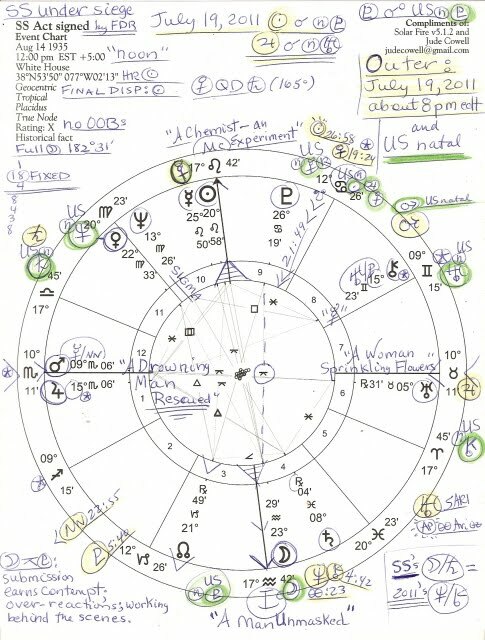 Horoscope: SS Act, signed August 14, 1935 with transits for July 18, 2011 8:00 pm edt Washington DC, outer; 1935's Hour: Sun; final dispositor: Sun; Phase: Full Moon 182:31; Mars and Jupiter rising in Scorpio, a big-business, money sign. Robber Barons ride roughshod again! Because last evening, July 18, 2011, in a 234--190 vote, the Republican-ruled House of Representatives passed their theatrical, Constitution-busting Cut, Cap, and Balance proposal which would gut our delicate economy to the quick and destroy America's social safety net (such as Social Security which is a self-sustaining insurance program.) It won't pass the Senate but if it does, President Obama will veto it, he says. Given the amount of human suffering its passage would assure, we may only pray that Mr. Obama stands up in a determined manner on behalf of the American people. Here you see the natal horoscope of the Social Security Insurance Act signed by President Franklin Roosevelt on August 14, 1935, exact hour unknown (using 'noon' at the White House: scroll down this blog's sidebar to view a video of the signing with its driving force, Frances Perkins, among the group surrounding FDR who worked with her in a progressive partnership from which the American people have benefited for 76 years. Perhaps you remember that community worker Frances Perkins witnessed the horror of people jumping out of the windows of the Triangle Shirtwaist Factory building when fire destroyed their lives so horribly, and presaged the 9/11 tragedy as The Twin Towers collapsed with people jumping to their deaths on NYC sidewalks again. Frances Perkins was behind our SS insurance program (along with Eleanor Roosevelt!) in an attempt to counter oppressive plutocrats and deliver much-needed aid to we-the-people. Yes, I'm currently reading The Woman Behind the New Deal about Secretary of Labor, Frances Perkins, among other things. US plutocrats/oligarchs/corporatists in 1933 had assumed FDR, once in office, would be their easily-manipulated toy and pawn; signings such as the SS Act in 1935 demonstrated differently--and enraged them. As we see, the high and mighty continue their battle against 'the little man' circa 2011 as social safety programs--the 'contract between generations'--is put on the congressional chopping block. The GOP argument that this action is necessary due to the US financial situation is a huge pile of bull feathers laced with manure. In the horoscope: ASC 10Sco11 with Mars and Jupiter rising shows the WHAT? Point of the chart (ASC) as '11Scorpio' = "A Drowning Man Rescued" which the program was designed to do, and it's interesting to me because of Grover Norquist's 'drown in a bathtub' philosophy now fully embraced (in public!) by a GOP whose Reagan-esque "government is the problem" and "starve the beast" mantras denote their deep determination to gut and dismantle all social safety net programs established by FDR's New Deal (Uranus) and LBJ's Great Society (Jupiter.) This includes Social Security insurance which is independently funded by contributions and thus is not part of our deficit, debt, or default problems. Now as you know, the financial battle in Washington concerns party ideology (ex: 'Swords v Torches') and how our financial resources are to be used. Apparently, the Vulcans at the Pentagon have more wars they wish to wage! But personally I agree with Thom Hartmann on such issues: Stop the Wars, Heal Americans. And perhaps if our money-printers, the Federal Reserve Bank, were actually federal and had reserves, things would be improved toward our alleged of-by-for-the-people democracy. 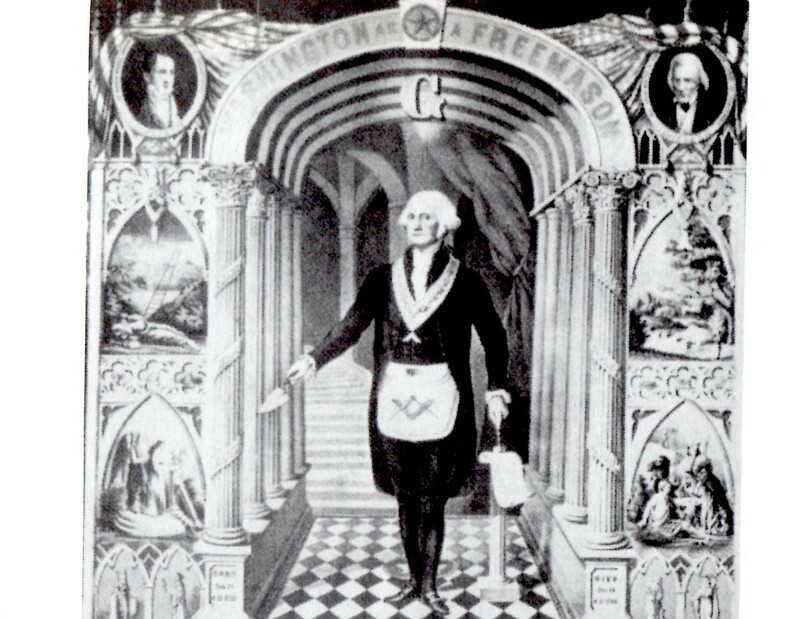 At the signing's Foundation (the Base or End of the Matter, the Ic) is '18AQ' = "A Man Unmasked" which I think refers again to FDR who was in process of disabusing wealthy class plutocrats (FDR's class by birth) of the notion that there were no limits to how shabbily, unfairly, and cruelly US citizens and workers could be treated by the ruling elite of his day. "A Drowning Man Rescued" indeed! But no longer, if Republicans and Tea Partiers have their cold hearted way in 2011. It seems the monarchists' "Let them eat cake" has become "Let them drown" which shows their equal disdain (aka, hatred and contempt) for the masses. On Descendant (Whereto? ), the Partnership axis, is "11Tau" = "A Woman Sprinkling Flowers" which relates to care and concern, and to Frances Perkins, I assert. It took Ms. Perkins much shepherding of FDR and others with cooperative teamwork between all involved parties to get the SS Act passed and signed! 1. 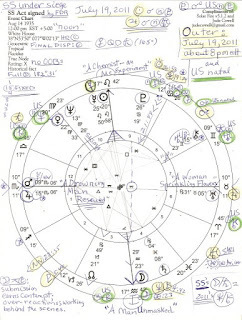 2011 Sun to SS's Pluto 26Can19: use of power emphasized; stronger aggression, self-will, and intensity are shown; becoming more formidable or dictatorial; resentments are provoked; manipulations come into view. 2. 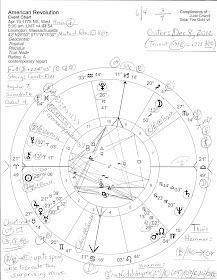 2011 Jupiter to SS's Uranus 5Tau31 Rx: issues of physical and intellectual independence surface; unpredictable inspirations; an egalitarian approach to dealing with others; personal networks expand; seeking to enlarge one's participation in events; areas such as finance, investment, fund-raising (tsk tsk: do they ever stop? ), technology, travel, astrology (! ), and group activities/projects are highlighted and broadened. 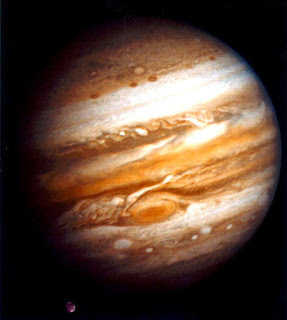 As you know, Jupiter will Station Retrograde on August 30, 2011 @ 10Tau21, Station Direct on or about December 25, 2011 @ 00Tau22 (a degree of violence), and will pass beyond his shadow (10Tau21) on or about March 18, 2012. It may be after that date before the ultimate fate of the American people's under-fire social safety net programs is known, or the positive or negative effects from Washington's monkeying with them is fully appreciated and experienced. For further reading and participation in our democracy before it dwindles away, try Van Jones' Rebuild The Dream.